Michael Jones sent this classic photo. 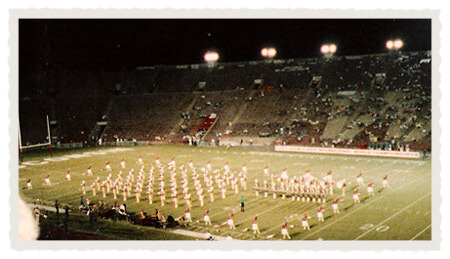 This is a picture of the Garfield Cadets at the end of the first half of "Jeremiah Suite" in 1985 during the World Championship Finals. 1985 was a pivotal year for the percussion section. That year we began our push to the illustrious drum title previously dominated by the Bayonne Bridgemen and the Blue Devils.